Almost finished with the Werewolf Cowboy. It's been a story that has taken a life of its own. I am placing it as Mating Mini #6 and when it is released, I will put the boxed set on sale for 99 cents so whoever hasn't read the other Mating Mini stories can indulge. I'm seriously thinking that Werewolf Cowboy may be my last PNR for a long time. The market has changed so much, and if I can't have good sales from this book, I may put away my werewolves. I still have one more Harlequin romantic suspense to write, and I need to get that done. And after? I am not sure. The entire publishing world has changed so much. But I do know this... much as I love to write, creating a story, paying to get it edited and proofed and buying a cover, means I have to do more than break even. If I don't get enough sales, then I end up losing money and that's not a good thing. So it's a test, and a wait and see game. I may venture into something new. I'm not sure yet. Right now it's more important to finish the book, and put it out for pre-order. So it's back to work! We were very, very fortunate in that Hurricane Matthew did not affect our area that much. We still have power, and the winds were only around 60 mph, if that, because the eye was 100 miles off our coast. So while we in S. Florida breathe a sigh of relief, good thoughts to those still in this hurricane's path. It has killed hundreds in Haiti. On another note, back to writing. I am finishing a novella in my Werewolves of Montana Mating Mini series. It's a werewolf romance, and it will introduce you to the underworld of the Dark Kingdom, a universe that is parallel to the "Skin" world where werewolves co-mingle with humans. No humans live in the Dark Kingdom. It's a world where only paranormal creatures reside, and the magick they produce can be very, very good, or very, very bad. Such is life in S. Florida. We haven't had a hurricane since Wilma in 2006, and that one did a lot of damage. The storm dropped a tree on my house and we had to get a new roof, plus two other trees fell, but thankfully NOT on the house. On the right is the barometer reading at 7:25 a.m. the day Hurricane Wilma struck. You can see how low it is...and I will get out the trusty barometer again to see how low it gets with this storm. Hopefully it will not! The lower the pressure the more intense the storm. And this is what happened during Hurricane Wilma... the tree fell on our Florida room, thankfully, and did not take out half the house, only the Florida room. I had been standing there moments before and realized I needed to get inside. Hurricane Wilma caused the power to go out for almost a week. The only good thing was that the weather was cool, so we could sleep with the windows open. Now it is very hot and sticky. And that's me standing between the two trees that fell in our backyard. Not happy! For Hurricane Matthew, we are prepared. WE have a generator, and gas, and we installed impact windows and an impact garage door. The hurricane may or may not brush past us. It's going to be close, but as with any hurricane, especially a Cat. 4, you don't fool around when you live five miles from the beach. I am worried about this storm and trying to stay calm. I had trauma during Wilma, and was so scared. I'm concerned about my butterflies, too. 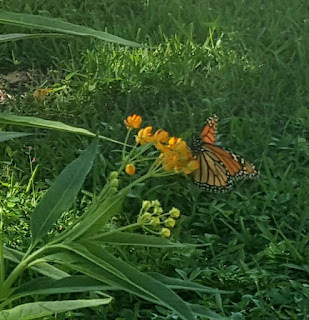 Sounds crazy to worry about butterflies during a hurricane, but I love my garden. 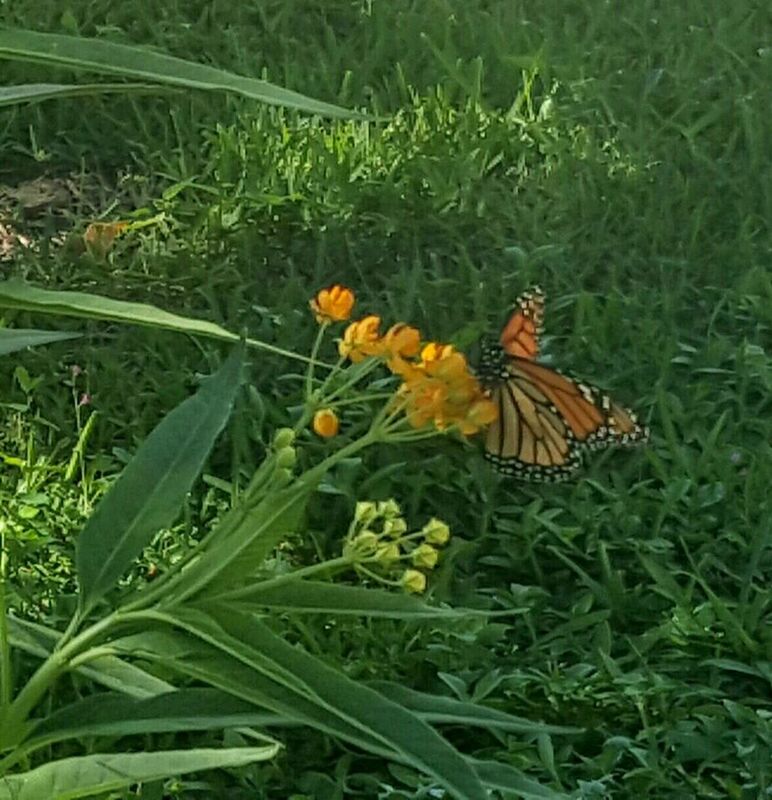 I'm doing what I can to try to save the monarch butterfly. This morning, the day before Matthew is supposed to approach our coast, I shot this photo of a monarch on milkweed we bought over the weekend. I think I'll take in the plants that are not on the ground and put them on the back patio. Stay safe, all in this storm's path. It's going to get nasty very soon. This is me with children at a Haiti orphanage back in 2007. These little ones lost their parents during a storm. Now Haiti is faced with yet another disaster - Hurricane Matthew. I don't travel to Haiti anymore, now that I work part-time. Yet in all my 21 years of travel, Haiti was always close to my heart. Weather forecasters say Matthew's 135 mph winds and torrential rains may cause "catastrophic" damage to the island nation. I've been all over Haiti, from Cap Haitian in the north, to Les Cayes in the South. They say Les Cayes will get badly hit by this hurricane. 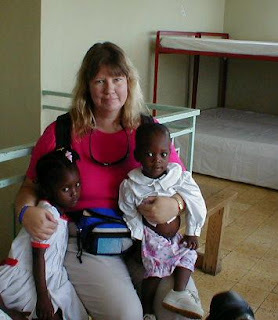 I was in Haiti shortly after the 2010 earthquake. The destruction was staggering. Some of those buildings that survived the earthquake are still fragile. Haitians are still recovering and many families still sleep in tents. I can't imagine being in a tent during a bad rainstorm, let alone a hurricane. Some are refusing to leave. It sounds insane, but you have to understand the poverty and desperation. They fear losing all they own, and they can't comprehend how bad this storm can be. I pray it won't be that bad, but from the look of it, Hurricane Matthew will deal a devastating blow to the country. One of the many mountainous areas in Haiti I traveled to. The biggest fear I have is not the wind in that country, but the rain. Torrential rains. Up to 40 inches of rain locally, they are predicting. Haiti has few trees and many denuded areas, as you can see in the photo to the left. This means flash floods and mudslides, as there is nothing to hold back the ground. One of my last trips to Haiti was to Les Cayes, the city in the south end. The ocean there is lovely, and there are little shops where you can order fresh fish. I keep wondering what will happen to all of those vendors and those living in that area after this storm. Haiti just can't seem to catch a break. All I can do is wait...and watch..and hope and pray.